Paul Charles Merson was born in Harlesdon in the London Borough of Brent, on 20 March 1968 and played 289 league matches for Arsenal , plus 29 FA cup matches, and 38 League Cup matches, plus 22 European games in the various cups. It is strange to think that while I was teaching in that part of London, there he was, a toddler, just up the road. I rather suspect he might have been a very naughty boy. 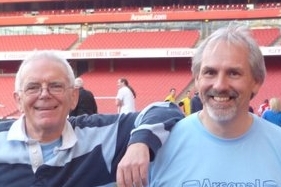 His football career started with Arsenal in 1986/7 and finished with Tamworth and Welshpool in 2006/7, although he did make three appearances for Whitton Athletic in 2011/12. His one loan spell in his early days with Arsenal was with Brentford who were managed by the Double winning captain of 1971, Frank McLintock. As can be seen, by the time of the two George Graham league winning seasons he was a regular in the side and in 1989 was voted Young Player of the Year. He made his England début on 11 September 1991 against Germany in a friendly. He was also part of the unique Cup Double side of 1993, and won the Cup Winners’ Cup in 1994. However at that moment of the height of his career he also took the very brave and dramatic step of openly admitting in a televised press conference to his multiple addictions, and went into rehabilitation. He returned just prior to the end of the George Graham reign but did play in the second consecutive Cup Winners’ Cup Final in 1995 after Graham had left. Merson continued to play in the one Rioch season. He then had one season under Arsene Wenger before being transferred to Middlesbrough on 7 July 1997. At the time of the transfer Mr Wenger said that when a good offer comes along for a player (£5m, the largest fee ever paid by a non-top league club), sometimes you have to accept it. However it should be noted that this transfer window was also the summer when Arsenal purchased Marc Overmars and Emmanuel Petit so it was clear that Merson was going to struggle to find a role in the team. Arsene Wenger was criticised at the time for the sale of Merson, and four defeats in six games between 1 November and 13 December 1997 caused further negative reporting in the press, with Arsenal being sixth in the league. Worse with the defeats being against clubs such as Derby and Sheffield W, plus home defeats against Liverpool and Blackburn, there was a constant stream of reports in the press that in losing Merson, Arsenal had lost its main playmaker. However although Arsenal slipped 12 points behind the leaders, we did recover in the second part of the season to win the league. Reports at the time suggested that Arsene Wenger had offered a new two-year deal to Merson prior to his leaving, and on 10 November 2014 Merson stated that Wenger “begged me to stay”. Middlesbrough however were reported to have offered double the salary – and obviously more chances of playing than at Arsenal, with Wenger expanding the Arsenal squad considerably. While Arsenal won the league, Merson’s Middlesbrough came second in the second division league in 1997/8 and won promotion, but in the summer of 1998 Merson was said to have accused Middlesbrough of being a club wrapped up in a drinking and gambling culture, although he denied this. Meanwhile Arsenal showed little sign of missing Merson, adding another midfielder, Freddie Ljungberg, to the squad on 11 September 1998. However as Arsenal were signing Freddie, Merson left Middlesbrough for Aston Villa. Middlesbrough survived without Merson and went on to finish a respectable 9th in the Premier League. From 1998 to 2002 Merson played for Aston Villa during which period the club came 6th and 8th, and lost the 2000 FA Cup final, and he played between 21 and 38 league games each season. Then in 2002 he signed for Portsmouth and played for them just for the 2002/3 season, when the club gained promotion to the Premiership, playing 45 league games in the league. There was then the move to Walsall in 2003 but here Merson missed a little of the season with a period in February spent in a clinic in the United States. However he did make 34 appearances out of a possible 46 for the club that season, as they finished 22nd and were relegated. During this final spell Merson was made player manager of the club and he continued in the role the following season. Walsall went on to finish 14th in the following season, but numerous media reports of his private life and his addictions distracted from the achievement and on 6 February 2006 he was sacked, and moved briefly to Tamworth where he played one game. He retired from playing on 9 March 2006, although on 28 March 2012 played for Welshpool Town along with two other Sky Sports pundits. Welshpool lost 4-1 and opted not to repeat the affair. In 2011 Paul Merson published “How not to be a professional footballer” which received very positive reviews. He had already engaged in writing prior to this having started a review in the Arsenal magazine in 2006. He now works as a pundit for Sky Sports and has a column in the Daily Star. Mr Wenger was then interviewed about Merson, and said, “I managed him, I tried” and little else. However Merson continued his attack on Wenger, claiming repeatedly that Wenger begged Merson to stay at Arsenal prior to his departure to Middlesbrough. As noted earlier, given the transfers in, at the time, and the subsequent winning of the championship, it is not clear if this really happened. So what can we make of Paul Merson’s anger in 2014 with Arsenal? I think he himself would admit that his autobiography makes it clear that (to use his own phrase) he is sometimes like a “fish up a tree” and indeed some of the stories in his book do reflect him becoming involved in actions and words that he later admits were not perhaps his best moments. Perhaps there is also the problem that although he gained promotion with Middlesbrough, he was clearly not happy there (whether or not the drinking culture story was true), and to rub salt in, Arsenal won the league without him. What’s more, although he moved on to play in the second division, many others of the old George Graham team stayed and had further success. The league winning team at Arsenal in the season after Merson left included Seaman, Dixon, Winterburn, Bould, Adams, Bergkamp, Parlour, Wright… and to these were being added Overmars, Vieira… Middlesbrough must have looked a little way from the action. Did Mr Wenger beg him to stay? Probably not given that only a two year contract was on offer at half the salary available in the second division. It is of course desperately sad to see Paul Merson still occasionally fighting his demons, still egged on by the newspaper anxious to splash him across the front or back page. One can only wish him well and hope that in middle age he can finally put the addictions behind him and find a more stable life. Die hard Wenger fan to the point that even when Merson correctly points out Wenger’s flows, that are clear for everyone to see, you still insist it’s personal! here is my opinion, Wenger has lost ambition, fight! he is tactically inept and is handling the club like his own property! he should have been sacked some seasons ago for clearly the club is now regressing like his philosophy and lack of tactical and technical nous! We can’t be held ransom by someone busking in past glory and there’s no hope! change is good,whatever it might bring, immediate success or time in transition like Man Utd, that remains to be seen, but! it is necessary we change management ASAP! Each and everyday comes out dissenting voice concerning how Arsene is running the club badly most notably by failing on simple things that can easily be sorted out! We had Wright, Viera, Merson and a host of others. Although Merson has personal problems in life like any of us, this can’t be used to cover the shortcomings that our manager keep on displaying time and again. We will forever respect Arsene and appreciate his good work for transforming Arsenal but one fact remains. He has become too stabborn and has immense powers which has clouded even his understanding! It would be great if he leaves because he has failed to bring required improvements that can take our club to another level! Forget all other things about Merson,he might be what he his,but being critical of what is actually happening in our beloved club needs positive criticism.Wenger and his followers have to accept it in good faith and effect some changes for the better. In their playing days, most professional footballers can hardly string a few words together to form a sentence. Then, miraculously, after retirement, they receive the power of speech and managerial knowledge and you can’t stop them talking……and running down their old club. “I managed him, I tried” and little else. How convenient that you left out the “little else” that Wenger said. Having a dig at his managerial record is hardly saying little else. Paul Mersons reply was the truth, his teams had never ended drawing after being 3-0 up. As an “expert” and one of the greatest coaches in football’s history you would hope that someone of the calibre of Arsene Wenger could also see this and, with his experience in top flight management, do something to stop this happening on a regular basis. Muscad – utterly agree. We need positive criticism. I am not sure that saying “clueless” about a dozen times in a short spell is that. If that is what they did Patrick I would worry as well.